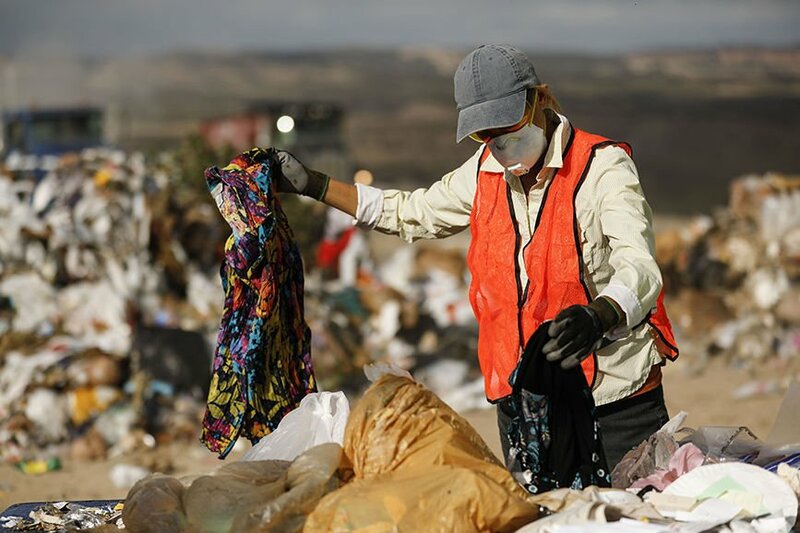 Janet Wyatt holds an article of clothing that she found in the trash while sorting through it during a waste study at the Mesa County Landfill. Nate Grove, a field technician, dumps bottles after recording the contents from a load during a waste study at the Mesa County Landfill on Monday. The brand-new prom dress is one of the big mysteries found in the great trash sort of 2018. It arrived at the Mesa County Landfill, still sealed in its envelope, untouched by the surrounding garbage in all its bedazzled splendor. Maybe the girl who ordered it hated the sequins. Maybe her date dumped her right before the dance, so she went ahead and dumped the dress, too. "You start making up stories as to why people throw these things away," said Mary Hertert of Fruita, a volunteer who helped sort garbage for the first time three months ago and returned for the second round this week. But there's just no making sense of some of this garbage, she's found. Hertert is helping out with a waste study commissioned by the landfill, which involves sorting 600 pounds of garbage every day into 32 different categories, recording the amounts and compiling the information for a report that will be available early next year. The sorting happened for a week in June and again this week, as those compiling the information gather samples that represent all of Mesa County, and ultimately will have a pretty good idea of what residents throw away. The study will provide a picture of exactly what types of things are entering the landfill, buried forever in the facility which is quickly running out of space. Landfill officials estimate about 65 percent of the waste thrown away every year could be diverted from the landfill, either recycled, composted or re-used in another way. The study aims to identify these opportunities and help develop a plan for reducing contributions to the landfill, which will reach its full capacity in 24 years if locals keep contributing trash at their current rate. According to 2013 statistics from the Environmental Protection Agency, Americans throw away about 4.4 pounds of trash per person, per day. In Mesa County, that number is 6.7 pounds of trash per person, per day. The plan is to determine what opportunities might be hiding here in this garbage. "You can't set up diversion efforts if you don't know what's coming in," said Graham Cottle, a staff engineer with Souder Miller & Associates, the firm hired to compile the data and produce the report. The study is funded by an $86,000 grant from the state health department, and also included one-day sorts for Delta, Montrose and Gunnison waste facilities. The trash sort isn't just about identifying what Mesa County is tossing, it's also about pinpointing targeted ways to keep residents from contributing to the landfill, taking up valuable space, said Barrett Jensen, the county's solid waste manager. The landfill recently invested in a new liner covering only four acres of the facility, which cost more than $1 million, Jensen said. The expansion is projected to last only two years. "Six hundred tons a day goes by fast," Jensen said. When this landfill reaches capacity, it's unlikely it will receive permits to expand the current facility, due to its proximity to the Gunnison River, Jensen said. The facility has plans to expand the compost facility next year, expanding the area by another 7 1/2 acres on top of an old landfill, which will allow more organic materials like grass clippings, leaves and yard waste to be transformed into Mesa Magic, the landfill's compost. In 2016, the facility sold more than 50,000 cubic yards of compost, which also had another benefit — it saved more than $740,000 in air space in the landfill, keeping those materials from taking up room. The landfill also has a household hazardous waste materials unit where residents can drop off materials like paint and batteries, to keep them out of the landfill and limit contamination. The facility cannot currently accept food waste, which is composted in some other communities, as that would require a change in permitting from the state, Jensen said. But he's trying to find ways to reduce food waste contributions to the landfill and has talked with private partners about possible solutions. In trash sorted Monday morning, the group noticed a lot of fast-food containers and coffee grounds. It came from a commercial dumpster near Colorado Mesa University. Some of the material really is trash and has nowhere else to go — including dog poop and an adult diaper weighing 3.75 pounds — which are classified as "all other organics." But other items, like clothing, unspoiled foods and toys, are puzzling. "It's trash, there's no perceived value," said Jennifer Richardson, the landfill's operations manager, but the truth is it has to go somewhere, and putting it somewhere costs money. Hertert said some of the battle is education, and that recycling can be confusing and sometimes requires an extra step that people don't want to bother with. "We don't know where to go, so we just do the most convenient thing," she said. "In a large part, it's out of sight, out of mind and we have a bad habit. How do we make it easy for people to do what they can? There's really some hard questions we've got to answer." Anyone wanting to volunteer or offer ideas on waste reduction can contact Jensen at jeffrey.jensen@mesacounty.us.